Boil and mash the potatoes. Take bread slices, sprinkle some water and crush it to make fresh bread crumbs. Add salt, lemon, cumin seeds and green chillies. Mix it well. Wet your hands with water and make small balls from this mixture. Press slightly from the top. Prepare all the balls. Take a kadai (wok) and heat oil. Deep fry all the rolls. 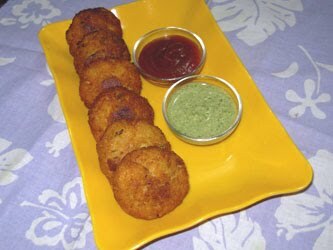 Serve it hot with green chutney and tomato ketch up.